Often described as a muscle spasm and choking sensation, the term "angina" is used primarily to describe chest (thoracic) pain originating from insufficient oxygen to the heart muscle. An episode of angina is not an actual heart attack, but rather pain that results from the heart muscle temporarily receiving too little blood. This temporary condition may be the result of demanding activities such as exercise and does not necessarily indicate that the heart muscle is experiencing permanent damage. In fact, episodes of angina seldom cause permanent damage to heart muscle. Angina can be subdivided further into two categories: angina of effort and variant angina. Angina of effort is a common disorder caused by the narrowing of the arteries (atherosclerosis) that supply oxygen-rich blood to the heart muscle. In the case of angina of effort, the heart (coronary) arteries can provide the heart muscle (myocardium) adequate blood during rest but not during periods of exercise, stress, or excitement—any of which may precipitate pain. The pain is relieved by resting or by administering nitroglycerin, a medication that reduces ischemia of the heart. Patients with angina of effort have an increased risk of heart attack (myocardial infarction). Variant angina is uncommon and occurs independently of atherosclerosis which may, however, be present as an incidental finding. Variant angina occurs at rest and is not related to excessive work by the heart muscle. Research indicates that variant angina is caused by coronary artery muscle spasm of insufficient duration or intensity to cause an actual heart attack. 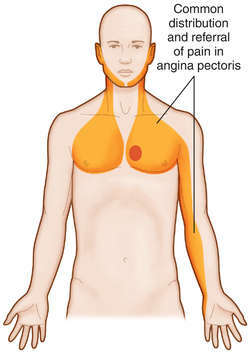 Angina causes a pressing pain or sensation of heaviness, usually in the chest area under the breast bone (sternum). It occasionally is experienced in the shoulder, arm, neck, or jaw regions. Because episodes of angina occur when the heart's need for oxygen increases beyond the oxygen available from the blood nourishing the heart, the condition is often precipitated by physical exertion. In most cases, the symptoms are relieved within a few minutes by resting or by taking prescribed angina medications. Emotional stress, extreme temperatures, heavy meals, cigarette smoking, and alcohol can also cause or contribute to an episode of angina. Physicians can usually diagnose angina based on the patient's symptoms and the precipitating factors. However, other diagnostic testing is often required to confirm or rule out angina, or to determine the severity of the underlying heart disease. An electrocardiogram is a test that records electrical impulses from the heart. The resulting graph of electrical activity can show if the heart muscle isn't functioning properly as a result of a lack of oxygen. Electrocardiograms are also useful in investigating other possible abnormal features of the heart. For many individuals with angina, the results of an electrocardiogram while at rest will not show any abnormalities. Because the symptoms of angina occur during stress, the functioning of the heart may need to be evaluated under the physical stress of exercise. The stress test records information from the electrocardiogram before, during, and after exercise in search of stress-related abnormalities. Blood pressure is also measured during the stress test and symptoms are noted. A more involved and complex stress test (for example, thallium scanning) may be used in some cases to picture the blood flow in the heart muscle during the most intense time of exercise and after rest. The angiogram, which is basically an x ray of the coronary artery, has been noted to be the most accurate diagnostic test to indicate the presence and extent of coronary disease. In this procedure, a long, thin, flexible tube (catheter) is maneuvered into an artery located in the forearm or groin. This catheter is passed further through the artery into one of the two major coronary arteries. A dye is injected at that time to help the x rays "see" the heart and arteries more clearly. Many brief x rays are made to create a "movie" of blood flowing through the coronary arteries, which will reveal any possible narrowing that causes a decrease in blood flow to the heart muscle and associated symptoms of angina. Artery disease causing angina is addressed initially by controlling existing factors placing the individual at risk. These risk factors include cigarette smoking, high blood pressure, high cholesterol levels, and obesity. Angina is often controlled by medication, most commonly with nitroglycerin. This drug relieves symptoms of angina by increasing the diameter of the blood vessels carrying blood to the heart muscle. Nitroglycerin is taken whenever discomfort occurs or is expected. It may be taken by mouth by placing the tablet under the tongue or transdermally by placing a medicated patch directly on the skin. In addition, beta blockers or calcium channel blockers may be prescribed to also decrease the demand on the heart by decreasing the rate and workload of the heart. When conservative treatments are not effective in the reduction of angina pain and the risk of heart attack remains high, physicians may recommend angioplasty or surgery. Coronary artery bypass surgery is an operation in which a blood vessel (often a long vein surgically removed from the leg) is grafted onto the blocked artery to bypass the blocked portion. This newly formed pathway allows blood to flow adequately to the heart muscle. Ischemia — Decreased blood supply to an organ or body part, often resulting in pain. Myocardial infarction — A blockage of a coronary artery that cuts off the blood supply to part of the heart. In most cases, the blockage is caused by fatty deposits. Myocardium — The thick middle layer of the heart that forms the bulk of the heart wall and contracts as the organ beats. Another procedure used to improve blood flow to the heart is balloon angioplasty. In this procedure, the physician inserts a catheter with a tiny balloon at the end into a forearm or groin artery. The catheter is then threaded up into the coronary arteries and the balloon is inflated to open the vessel in narrowed sections. Other techniques using laser and mechanical devices are being developed and applied, also by means of catheters. During an angina episode, relief has been noted by applying massage or kinesiological methods, but these techniques are not standard recommendations by physicians. For example, one technique places the palm and fingers of either hand on the forehead while simultaneously firmly massaging the sternum (breast bone) up and down its entire length using the other hand. This is followed by additional massaging by the fingertip and thumb next to the sternum, on each side. Once the angina has subsided, the cause should be determined and treated. Atherosclerosis, a major associated cause, requires diet and lifestyle adjustments, primarily including regular exercise, reduction of dietary sugar and saturated fats, and increase of dietary fiber. Both conventional and alternative medicine agree that increasing exercise and improving diet are important steps to reduce high cholesterol levels. Alternative medicine has proposed specific cholesterol-lowering treatments, with several gaining the attention and interest of the public. One of the most recent popular treatments is garlic (Allium sativum). Some studies have shown that adequate dosages of garlic can reduce total cholesterol by about 10%, LDL (bad) cholesterol by 15%, and raise HDL (good) cholesterol by 10%. Other studies have not shown significant benefit. Although its effect on cholesterol is not as great as that achieved by medications, garlic may possibly be of benefit in relatively mild cases of high cholesterol, without causing the side effects associated with cholesterol-reducing drugs. Other herbal remedies that may help lower cholesterol include alfalfa (Medicago sativa), fenugreek (Trigonella foenum-graecum), Asian ginseng (Panax ginseng), and tumeric (Curcuma longa). Antioxidants, including vitamin A (beta carotene), vitamin C, vitamin E, and selenium, can limit the oxidative damage to the walls of blood vessels that may be a precursor of atherosclerotic plaque formation. The prognosis for a patient with angina depends on its origin, type, severity, and the general health of the individual. A person who has angina has the best prognosis if he or she seeks prompt medical attention and learns the pattern of his or her angina, such as what causes the attacks, what they feel like, how long episodes usually last, and whether medication relieves the attacks. If patterns of the symptoms change significantly, or if symptoms resemble those of a heart attack, medical help should be sought immediately. In most cases, the best prevention involves changing one's habits to avoid bringing on attacks of angina. If blood pressure medication has been prescribed, compliance is a necessity and should be a priority as well. Many healthcare professionals—including physicians, dietitians, and nurses—can provide valuable advice on proper diet, weight control, blood cholesterol levels, and blood pressure. These professionals also offer suggestions about current treatments and information to help stop smoking. In general, the majority of those with angina adjust their lives to minimize episodes of angina, by taking necessary precautions and using medications if recommended and necessary. Coronary artery disease is the underlying problem that should be addressed. "Angina." Healthtouch Online Page. Sepember 1997. [cited May 21, 1998]. http://www.healthtouch.com. (an'ji-nă, an-jī'nă), Although the correct classical pronunciation stresses the first syllable (an'gina), the stress is often placed on the second syllable (angi'na) in the U.S. In medical German, the simple word Angina refers not to chest pain due to myocardial ischemia but rather to severe pharyngitis. 1. A severe, often constricting pain or sensation of pressure, usually referring to angina pectoris. 2. Older term for a sore throat from any cause. angina of effort stable a. pectoris; see a. pectoris. herpes angina , angina herpe´tica herpangina. intestinal angina cramping abdominal pain shortly after a meal, lasting one to three hours, due to ischemia of the smooth muscle of the bowel. Ludwig's angina a severe form of cellulitis of the submaxillary space and secondary involvement of the sublingual and submental spaces, usually from infection or a penetrating injury to the floor of the mouth. angina pec´toris paroxysmal pain in the chest, often radiating to the arms, particularly the left, usually due to interference with the supply of oxygen to the heart muscle, and precipitated by excitement or effort. It is subdivided into stable and unstable a. pectoris based on the predictability of the frequency, duration, and causative factors for attacks. Prinzmetal's angina a variant of angina pectoris in which the attacks occur during rest, exercise capacity is well preserved, and attacks are associated electrocardiographically with elevation of the ST segment. silent angina an episode of coronary insufficiency in which no pain is experienced. variant angina pectoris Prinzmetal's a. 1 a spasmodic, cramplike choking feeling resulting from insufficient oxygen supply to the myocardium, commonly caused by coronary artery disease. 3 characterized by a feeling of choking, suffocation, or crushing pressure and pain. Kinds of angina are decubitus, intestinal, Ludwig's, preinfarction, Prinzmetal's, stable, streptococcal and unstable. anginal, adj. A sense of suffocation, impending doom and crushing pain in the chest and neck which classically extends to the left arm. Angina is associated with coronary heart disease, and is typically often brought on by exercise. Angina pectoris Cardiology A condition characterized by 'suffocatingly' intense pain, exertional substernal pressure radiating to the jaw/left shoulder/left arm, associated with N&V, dyspnea, diaphoresis, lasting < 30 min, which is relieved with nitroglycerin and rest, and classically accompanied by a sense of impending doom DiffDx Aortic dissection, costochondritis, GERD, intercostal neuritis, MI, peptic ulcer disease, PTE, tension pneumothorax, unstable angina Diagnosis Clinical history, EKG at rest and during activity, thallium stress test, coronary artery angiography EKG ST segment depression, T wave flattening Risk factor modification Smoking cessation, treat HTN, DM, ↓ cholesterol Management Initial therapy assumes acute MI–ergo aspirin, O2, beta-blockers, heparin, telemetry monitoring Medical therapy Nitroglycerin, long-acting nitrates, beta-blockers, CCBs Surgical therapy PCTA, CABG, stenting. See Canadian Cardiovascular Society functional classification, Chronic stable angina, High-risk unstable angina, Intestinal angina, Prinzmetal's angina, Recurrent angina, Unstable angina, Variant angina. Cf Prinzmetal's angina. A severe, constricting pain; usually refers to angina pectoris. 1. A sore throat severe enough to cause a sensation of choking. 3. One of a number of conditions featuring painful spasms. n heart pain characterized by spasm, cramping, pressure, or choking. (an'ji-nă) Although the correct classical pronunciation stresses the first syllable (an'gina), the stress is often placed on the second syllable (angi'na) in the U.S. Severe, often constricting pain or sensation of pressure, usually referring to angina pectoris. n a spasmodic, choking pain. The term is sometimes applied to the disease producing the pain (e.g., Ludwig's angina). 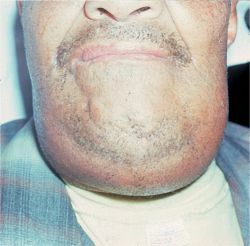 n.pr a cellulitis involving the submandibular space and characterized clinically by a firm swelling of the floor of the oral cavity, with elevation of the tongue. n a “sore throat” associated with infectious mononucleosis. n a symptom of cardiovascular diseases; characterized by a severe, viselike pain behind the sternum that sometimes radiates to the arms, neck, or mandible. It also includes a sense of constriction or pressure of the chest. Angina pectoris is caused by exertion or excitement and is relieved by rest. n an older term for involvement of the pharynx by the spread of necrotizing ulceromembranous gingivitis. See also gingivitis, necrotizing ulcerative.